Total of ten massage points to make you feel comfortable and cozy. Six massage points and one heat point on the back. Heats up and makes you warm. 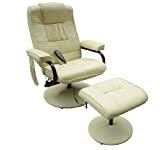 Massage force and heat temperature are provided preset on 9 modes which can be manually adjusted. • Weight capacity: 120kg. • In-built pockets for remote control, both left and right side. • 10 vibration massagers and 1 in built heater.